We like explanations that are simple, easy to understand, and explain everything. One example of this is the idea that eating carbohydrate, or sugar, is the primary cause of obesity. This lets us point our finger at something concrete and change our behavior accordingly. And it's true enough that it has practical value. But the world around us often turns out to be more complex than we'd like it to be. The CDC recently released its latest data on the prevalence of obesity in the US, spanning the years 2013-2014 (1). These data come from its periodic National Health and Nutrition Examination Surveys (NHANES). Contrary to what many of us had hoped for after a slight decline in obesity in the last survey, the prevalence has once again increased. Today, roughly 38 percent of US adults have obesity. As a nation, we're continuing to gain fat, which is extremely concerning. I decided to examine the relationship between obesity prevalence and our intake of carbohydrate and sugar over the years. The food intake data come from the USDA's Economic Research Service (2). For some reason, the data on carbohydrate don't extend beyond 2010. This probably relates to funding cuts at the USDA*. Carbohydrate intake peaked in 1999, and has apparently been declining since then. Yet obesity is still rising. The relationship is even clearer here. 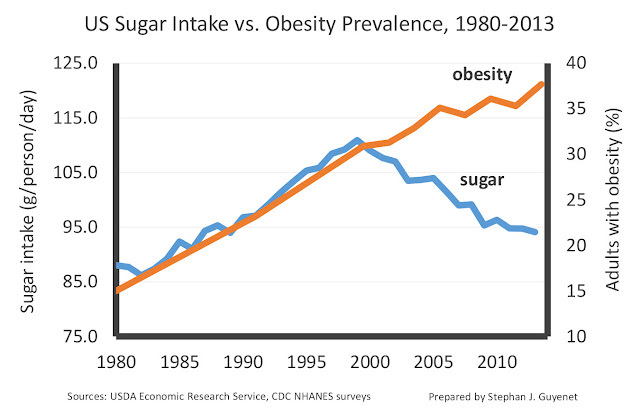 Our sugar intake has been declining since 1999, and is now back to where it was in the late 1980s. Yet our waistlines keep expanding. Refined carbohydrate and sugar are certainly part of the cause of the obesity epidemic, but these data are consistent with a large body of research suggesting that there's more to the story. Obesity is caused by a number of interacting diet and lifestyle factors, most of which can be traced back to major socioeconomic changes in this country over the last century. These have affected the way we interact with food, the composition of our food, and other aspects of our lifestyle that cause genetically susceptible people to gain fat. * Which leaves us with a record of US dietary intake that ends somewhere between 2010 and 2013. In my view, this is a serious threat to public health research. You did it again Stephan: plotting % obesity as you y-variable. As a reminder (we discussed this before), it makes more sense to use average BMI, because % obesity is the proportion of people who cross the arbitrary threshold of BMI 30. This makes obesity a yes/no question (categorical data) instead of a continuous variable. Unless you want to do cluster analysis (in this case, you don't), it is more telling to use a continuous variable like avrage BMI. Other than that, thanks for the data fetching / crunching. It is quite enlightening. I'm not sure why it's a problem to put obesity on the y-axis, since it is the dependent variable vs. time. Do you mean I should have done a scatterplot of obesity vs. CHO intake? While that is certainly a better way to look at associations, the problem is that people without a science/math/stats background won't understand it intuitively. Regarding average BMI, it would be preferable, but it's harder to come by those data, and in my previous experience I've found that they track fairly well with % obesity. So have protein or fat gone up in this time period or are total calories down? I was a low-carb die-hard. A complete evangelist, I'd lost 60lb, never felt hungry, my IBS all but disappeared and got to eat bacon and cheese and steak, what's not to love? Until I started suffering health problems, first vertigo, which is very scary, then panic attacks and low blood sugar episodes. I became completely intolerant to caffeine. Turns out if you make your liver pump out glycogen from protein constantly it gets fed up after a while and that's when the problems hit. I had to eat carbs, but still liberally ate fat, unsurprisingly my weight balooned. My IBS became debilitating once more. In a last ditch effort to avoid the starch and fiber that hurt my stomach I switched to mainly sugar as my carb source. I expected more weight gain but it was better than feeling sick all the time. But then a surprising thing happened, I lost weight. It just kept falling off, it kept falling off the higher my diet was in sugar. I dropped the fat a little but not really consciously. My energy levels returned. I'm not 100% better but I'm on the road to recovery. I have no longer any dogma to spout, I have no idea if anyone else would have the same experience as me or not, I'm not so sure about anything any more! But I do know that the demonisation of sugar is probably overstated. Thanks for your story. One thing that always perplexed me in the midst of my own Atkins worship was the skinny sugar junkie. I knew several people at work who seemed to live on hard candy, soda and white bread sandwiches with almost no meat. They seemed to always be eating a little something here or there. I came to conclude that they were, in effect, on a sugar drip. This seems to have prevented them from the gorging/fasting cycle that I often engaged in. Now, I also suspect they were keeping their thyroid ramped up with a steady supply of calories, whereas mine has declined, as is common with very low carbohydrate diets. Check out Ray Peat for an explanation on stressful diet as opposed to an anti-stress diet. Bottom line is that sugar is a beneficial source of calories in the context of a nutrient replete diet. Have you checked out Ray Peat (or the Danyy Roddy blog that describes his dietary approach)? They are very pro-sugar, believing it's the transport mechanisms, not the sugar itself that causes health issues and obesity. Would you be able to do this same analysis with total calories? Everyone like to demonize one component of the diet but I'd like to see total calories. No one seems want to talk about eating less (of anything or everything). Such an analysis should show that our total calories continue to rise. There are times when carbs, specifically high glycemics like sugar and flour, are the devil. Overeating them made me diabetic when I was obese. But losing weight fixed that for me and I eat them again as much as I ever did pre diabetes. I changed. Now they're calories I need to support exercise. People hang on to their Big Dogmas, past the point of usefulness. Atkins and Pritikin hung on to theirs to the end of their lives. Ancel Keys hung on to the Med until he was 100. IMO he had a better Big Dogma...but I have to wonder whether he would have made 105 if he had switched to HFLC or LFHC when he hit 95. From 1970 to 2005 total calories, fat and carbs were all up, fat most of all. I estimate US fat intake at 50% of calories (35% added, 15% part of a whole food) by 2005. Since then it appears that sugars have dropped, but I don't know about fat. We're probably still the reigning world champs for total calories and fat calories eaten. Apparently to celebrate this my Dr quit running my blood panels this year. He said they were useless. Too much data. So into vacuum of data I go. I have not been alive for much longer past the graphed reduction in CHO intake, but it seems to me that people largely still default to carbohydrates as the basis of their diets. In addition to the meal compositions I just alluded to, any snack foods or consumption of foods outside normal meals are also high carb, low protein foods - chips, cookies, various alcoholic beverages, etc. Personally I'm happy to skip the Sysco-supplied dining hall fare that's god knows how old for grass-fed and pastured meats, tubers, and local organic veggies I prepare myself. "Nutrient estimates are currently based on the ERS Food Availability Data System and not the Loss-Adjusted Food Availability Data System; thus, they represent nutrients and foods available for consumption and not actual nutrient intakes by individuals. Nutrient levels of the food supply should exceed recommended allowances because these values do not account for further losses from trimming, cooking, plate waste, and spoilage. Another limitation is that per capita values are averages for the U.S. population, although food is not equally distributed among the population." "...and not actual nutrient intakes by individuals." So you are comparing what is available and not what people are intaking. You would be better served looking at the food intake data, but it will be more work for you and will not necessarily back up the argument that you're trying to make. Who knows though? You also need to make sure you add up all CHO sources while doing this (eg: sugars alone, added and from fruits, etc. ; CHO from flour, legumes, etc. ; ...). It would be interesting to see the results from that information and the USDA has a bunch of databases that cover this, but you need to have the appropriate software and a pc (not mac). Go through all of that and make your data set available and I'll start to look at this as making an informative argument. Until then all I see is a prime example of bias reporting. Yes thanks. I think the sugar junkie can be skinny fat for a long time, while their health deteriorates due to poor nutrition. But then it catches up. The problem with carbohydrate is not what's left in, but what's taken out. I liken it to a car. If your car has oil, then it can remove impurities and still run smoothly. If the car has no oil, it comes to a screeching halt. When you remove fiber, vitamins and minerals from grains etc, the body doesn't have the "oil" it needs. A big breakthrough in my thinking was realizing that every cell in the human body uses glucose, and preferably so. 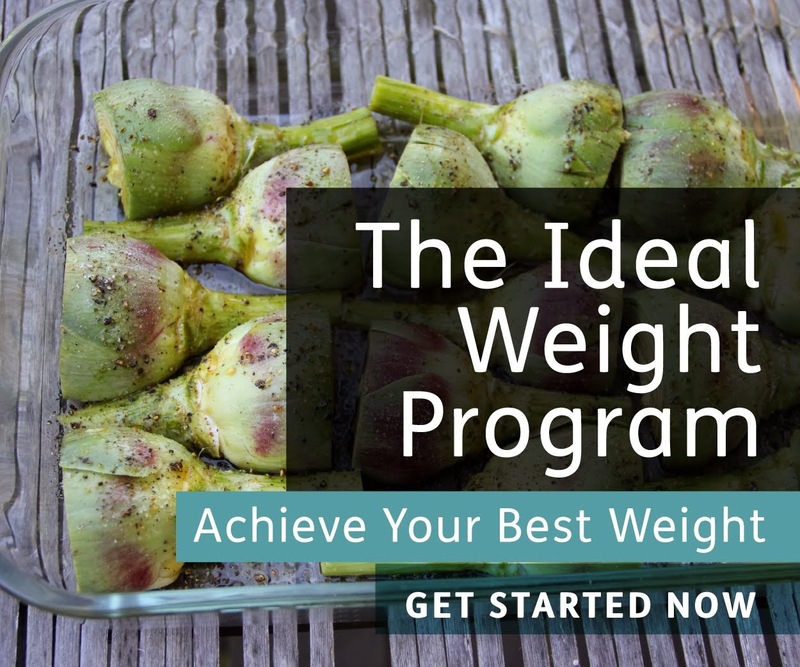 The problem I'm having is reversing the metabolic damage, while wanting to lose weight. It's hard psychologically to eat more starch. I recently watched the videos "survival of the smartest" with Dr. Schwarzbein and realized I'm constantly in a using state, due to my use of caffeine, meat and fake sweeteners. A low carb diet is more about being fat adapted and to be fat adapted one can't eat a high protein diet since protein is converted into glycogen via Gluconeogenesis. A perfect example of how less sugar (BUT STILL EATING WAY TO MUCH CRAP) doesn't equate to lowering the obesity rate. This is only one part of a very complex problem with eating a highly processed western diet. To start... I'm curious what the study considered as SUGAR or a simple Carbohydrate. Whole grain wheat bread will spike you blood sugar faster then white bread or even a snickers bar... and all three if over consumed will contribute to insulin resistance and metabolic dysfunction, and Type II Diabetes. At the end of the day it all comes down to Blood Sugar, e.g., if your Yo-Yoing your blood sugar everyday all day then your at a greater risk of gaining weight and obesity. Buy a blood glucose meter $10 at any drug store and check your blood sugar throughout the day. I guarantee you that a majority of Americans are Yo-Yoing up and down all day and are on there way to some form of Metabolic Dysfunction due to diet and life style, and don't even get me started on how so many people don't sleep enough which also contributes to obesity. So sleep 8-9 hours a night, eat nutrient dense - unprocessed foods, healthy fats rich in Omega 3 and you will not become a statistic. If you had bothered to look, you would see that 1) the sugar data are loss-adjusted, and therefore are estimates of intake; and 2) the CHO data are not loss-adjusted but they track well with loss-adjusted data for major CHO-containing foods, like added sugars. The CHO data are higher than actual intake because they aren't adjusted for loss, but they still reflect trends, which was the point of the post. The data aren't perfect, but they're the best we have. If you can find better, please share your knowledge with us. I am not sure why people want to find special reasons to how one gets fat while the 1st order factor has been known like forever: overeat, don't move, do this all the time and you grow fat. There are subtle mechanisms, etc, our body is smart in many ways, but notwithstanding 2nd order effects such as macro partitioning, mineral status, etc, the reason for getting fat is that you don't spend as much as energy as you should. And one way to address that is to be active and be reasonable about how much you eat (I am not saying one must starve or avoid carbs / fat / whatnot) it is a prescription that anyone can follow at no cost. Does this take into account that the group you are looking at now has a higher average age? But we've also increased our consumption of fat mainly from polyunsaturated oils and even saturated fat from cheese. Obese people eat both. They often go together in many foods such as pizza-vegetable oil in the dough and cheese on top, donuts, fried starch with cheese added like nachos etc. These surely play a role along with HFCS. The data are age-adjusted so we're comparing people of the same age. It would be interesting to see how the use of artificial sweeteners fits in here. I would bet it continues, or even outpaces the upward slope of sugar, and might be a factor as to why obesity isn't coming down. Let me illustrate the problem of using categorical variables. Suppose you had made your graph with % overweight on the y-axis instead of % obesity. What would you see? Probably nothing at all. The average BMI has increased in the population, but the proportion of people falling into the arbitrary category of 25 < BMI < 30 hasn't changed much. Now, you are using the uppermost category in your graph, so the problem is not so obvious. Yet, obese people in 1980 were on average quite a bit leaner than obese people in 2010. This information is completely lost when you use % obesity. Maybe one further example would convince you. Suppose you want to know if the population grew taller over time. You would use time as the x-variable. Would you use % tall people as your y-variable? Or % little people? (Defining some arbitrary threshold for tallness of littleness.) No. You would use average height. Changing your average carb consumption from 490 to 470g a day wont have any noticable effect on insulin levels. If fat intake increases at the same time the insulin will continue to drive fat gain. looking at the first chart, with over 470 g of carbs per day, that equals 1880+ calories per day from carbs alone, so just based on that I am not surprised at all. add to this that there is far more poor than rich who are overweight and there you have an answer. The food that poor can afford is not the same(far more sugars and less healthy) as the food that rich can afford. I think you are on to something here - and a graph with average weight vs vegetable oil consumption would be interesting. Could be that eating salads make us fat - full of PUFAs. My hunch is the obesity pandemic is due to a combination of fructose containing sugars and vegetable oils. No one has done any human synthetic diet research on these oils. We eat 5x as much PUFA's today than we did in the 1960's. These are not human foods. While the detection rate may also have changed over the same period, it is interesting to note that heart attacks have increased with increases in vegetable consumption. Which reminds me - there are other reasons to avoid carbs and particularly sugars than obsity - cancer rates, quality of life. So where would the % obesity be if carb intake had kept rising? If it stayed on trend it would be well over 40%. A reduction in carb intake appears to have slowed the rise in obesity. You certainly can't say there is no association between the changes, but it looks like obesity won't start dropping till carb intake goes below baseline. As we would expect, if we imagine this as happening to an individual. As for sugar, don't forget that people have started replacing it with all sorts of things that are also sources of sucrose, glucose or fructose. In Australia there has been controversy surrounding the data used for sugar consumption at a population level. The two charts aren't measuring the same thing. Sugar is a tracked commodity, which is why the USDA breaks it out, what people who think you should cut carbs often mean is that sugar(s) and refined carbohydrates should be reduced. It's not the placement of the variable on the y axis which is incorrect - it's the expression of your dependent variable as a % of the population who have a BMI over 30. If dropping your sugar intake leads to a reduction of your BMI from 37 to 31 this would not be reflected in your misleading graph. The other thing is that the average intake of CHO may have come down but it's still at an outrageously high level. Hi, as an average educated person with allergies I would say discussing which particular component of food is related to obesity is not the most relavant point, it is the processing of food that causes many of our health problems including obesity, if you remove packaged food from your diet and eat 'proper food' meat, fish, veg, fruit etc which we were intended to eat the level of fat v sugar in the food is not relavant we would all be healthier and slimmer. Whilst processing food over the years various forms and levels of fat, sugar and other ingredients have been added to make it more 'palitable' and enable the mis leading labelling of 'low fat' 'light' etc eat unprocessed food! sounds radical and yet it is simple like me. Could the comparison be done with processed food intake? I agree that it can be a problem theoretically, but I have already shown that mean BMI has tracked well with % obesity. In practice, the two are highly correlated. I just did a scatterplot of obesity prevalence vs. mean BMI between 1961 and 2009 to verify this, and the R2 value is 0.996. So in practice, obesity prevalence is an excellent proxy for mean BMI even though it's not a continuous variable. See my response to Valerie above. You might want to think things through a little bit before accusing others of being misleading. I can't speak for Costas, but cutting the y-axis of a graph is a notoriously misleading way to present data. It is used as an example of what not to do in statistics classes. The recommended, non-misleading way is to have your y-axis start at zero. Now, with two y-axes, I guess you are supposed to have both axes start at zero (the curves will not be superimposed), and let the reader decide if the trends follow each other. The way you presented the data here, we get the impression that there has been a huge change in carb/sugar consumption. And, well, I would agree that it is misleading. Stephan, any chance you can post that average BMI vs obesity % graph? A R2 of 0.996 is extremely high! ... unless you are using a regression going through the origin, in which case the R2 is artificially inflated (well, to be precise, that will depend on the software/formula you use). That would explain it. Thanks Valerie - you have eloquently captured my concerns too. Stephen I am sure this was not your intention but - as Valerie is alluding - there are a few 'suspicious' signs in the way you are presenting the data and I am still not clear why you decided to follow this specific approach. Whether or not a graph is misleading depends on the claim it's being used to support. In this case, I didn't claim a large magnitude change in carbohydrate intake-- I only claimed that carb intake has declined while obesity has continued to increase. That is clearly supported by the data, no matter what the axes look like. People can use their own two eyes to look at the axis and see what the magnitude of the change was. An axis does not always have to start from zero, and it is not inherently misleading to do so. It just depends on the point you're trying to support. I was never told not to cut axes in any of my stats classes or during my other scientific training; in fact it's commonplace in scientific figures. I'll add that in many cases it would be absurd not to cut axes, because it can obscure meaningful information. For example, if you have a scatterplot where the scatter is clustered at high numerical values, you wouldn't be able to evaluate the cluster without cutting the axes so you can see the spread properly. I would have to put up a post to share the graph, which I don't want to do. However, I will provide you with the raw data which you can scatter yourself and calculate your own R2. The regression did not go through the origin, it's simply an extremely tight correlation. Left column is year, middle is mean BMI, right is obese %. Decimals after the year (e.g. "1999.5") reflect the fact that the NHANES data are from year ranges. I used the midpoint for my graphs, and in some cases that doesn't end up being an even number. 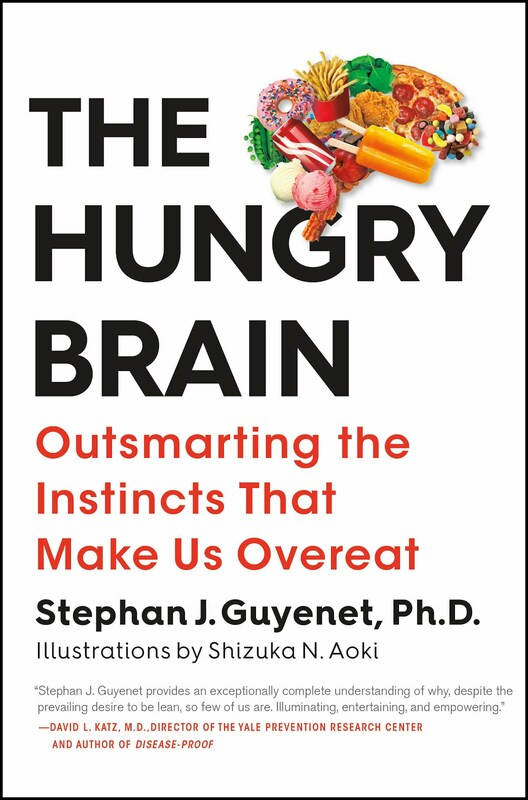 Stephan - you appear to be ignoring gestational and other magnifying effects that are at play - do you really expect a sudden response to macro carb moderating? Do you really think that this is indicative of anything given the complex interplay and second-order effects? I'm a tad surprised if so. My thoughts go to the fact that people simply eat far too much food in the western world. Its too easy to over eat. "Want to upsize?" Food portions are larger the cheaper the food (of course). I eat large amounts of unprocessed food, my accumulated intake is much lower than the average and I am at close to a normal BMI for the first time in my life. We all eat too much and have normalised what would have been considered overweight 40 years ago. For me when Australia went to kilos - what sounded large in 1960s ie 12 stone woman sounds acceptable 76kgs in todays lingo. We eat too many calories regardless of what they are. We shove too much food in our mouths. Oh Steven. I did not see this with your graph at first, but I do believe Valerie is correct. The problem is % obesity being a yes no question based on a value instead of seeing the average value over time. Let me try to illustrate. So by this measure, someone is obese if they are at 31 BMI or if they are at 50 BMI. They are not obese if they are at 29 BMI or 16 BMI. Let's pretend for a minute that back in the year 2000, the approximately 30% of obese individuals all were obese with a 55 BMI. Every single person who was obese was at a 55 BMI. Let's pretend in 2000 everyone who was not obese had a BMI of 29.... Every single person. Now let's look at now. Now let's imagine the current year. Let's pretend that of everyone who was obese they all had a BMI of 31... Every single person, but everyone who was not obese had a BMI of 19. Every single person. Now in this imaginary data world one can see by the population that the present year was not so bad. Every person who was obese was only obese by one point, but everyone who was not obese was significantly not obese. So as a population whole we were actually all loosing weight. It is because when the line is set at 30 and a yes no answer is taken you do not know how high the average yes is or how high the average no is. Average BMI of the population would be more telling over time for that reason... I do agree with you though...until you picture some extreme number examples in you head it can be hard to see why. If you were able to get your hands on average BMI data the chart may look the same or it may look completely different. This is why so many people say statistics lie :) Sometimes people can manipulate numbers in this way purposely to tell the story they want to tell... Even if it is a lie. (Not implying you are lying here, but that we don't know the real story because you do not have access to the right data). I imagine the chart may look similar anyway, but we do not know. Love reading your blog. Keep up the good work. And if you do get access to average BMI over time I'd love to see a new post. Hopefully this illustration was helpful. The reduction in carb intake to 470G/day is still a huge amount of carbs - no wonder people are still gaining. If you make the same graph with vegetable oils - the consumption which is STILL increasing you get a similar result. No one can say that we have evolved to eat these oils. There is another problem - the wheat/corn etc that people eat today has more PUFA than before. And the livestock that are now corn fed - has a quite different fat content than grass fed - including storage of unsaturated fatty acids that are prone to lipid peroxidation (even more so when blood glucose is elevated). There are really two problems - the obesity pandemic and the health effects of eating inflammation promoting foods (PUFAs and sugars). This inflammation is the likely driver of CAD not to mention a host of other diseases - including depression/Alzheimer's/macular degeneration/kidney/cancer etc etc etc... Causing a reduced quality of life is a bad thing IMO. People that did research on the health hazards of vegetable oils got their funding cut - carriers ruined. Although the data looks good in print its highly speculative that it’s an actuate assumption due to the fact that although carb and sugar consumption had went down, it’s still far too high for a healthy hormone balance or proper normal metabolic function . After reading "Missing Microbes", I am aware that there may be something other than macronutrients to consider. Could the problem be that sugar has been replaced by artificial sweeteners? Apart from the obvious issue with the obese YES/NO variable which Valerie correctly mentioned, it is not clear whether the grams of CHO are an average. Maybe the explanation is that we have been consuming less carbs in average, but some people are getting slim while the others keep eating insane amounts of carbs. Of course epigenetics also play a role. As a matter of facts, reducing carbs (and with this I do not perforce mean low-carb or ketogenic diets) do promote weight loss and protection against a number of diseases. The research is interesting but it is not fully convincing me. I repeat, the correlation between % obesity and average BMI is greater than 0.99. In other words, obesity % is an excellent proxy for average BMI. Because of this, the categorical vs. continuous variable concern is a non-issue. Indeed. We use categorical outcome variables all the time in epidemiology. Continuous variables are not always appropriate and results can be harder to interpret. Why is BMI even used as an obesity metric anymore? How can you declare some one obese without measuring their % body fat? In related (?) news, rate of increase in diabetes in America has begun to slow down. "New Diabetes Cases, at Long Last, Begin to Fall in the United States!" I wish I had seen this post and comments sooner, but the audacity of some people never ceases to amaze me. Dr. Guyenet does all the research work, the analysis, creates the graphs, and kindly posts them for everyone to read -- free of charge. Then "Valerie" attempts to correct him with, "Let me illustrate the problem of using categorical variables…," as if he could not understand it. Then, "Costas" jumps on board her bandwagon. You two remind me of the "armchair quarterbacks" on Sunday afternoon, who never played the game nor coached in your life, yet second-guess every play the coaches call. If you were both so concerned that the graphs were "misleading," why didn't you go to the USDA ERS, gather all the data yourselves, plot the graphs, and then come back and provide a link to your "correct" graphs? I see that neither of you did that! If you had, just to get your goat, I might attack your use of BMI as an "inaccurate and misleading" graph that suggests BMI is an indicator of obesity. After all, I am 6'1" and 210 pounds, with a BMI of about 28, but I am 7% body fat. Maybe, just maybe, I'd start a discussion with you arguing that BMI doesn't reflect obesity… Maybe I'd suggest to both of you that much of the nation is now just bigger, with more muscle and less fat -- again, just because you can't seem to respect all of the knowledge and work that wen't into the graphs and the post. Nah… perhaps I shouldn't have wasted my time on this post, for the sake of two armchair quarterbacks. my comments to Stephan were meant as constructive criticism. I didn't mean to offend. By the way, data analysis is what I do for a living. I found this article that explains (more eloquently than I was able to) why it often makes sense to truncate the Y-axis. The article explains clearly, using examples, why my way of presenting the data is not misleading. "I didn't claim a large magnitude change in carbohydrate intake -- I only claimed that carb intake has declined while obesity has continued to increase." That is correct. The graph served to illustrate the direction of the trends, not their magnitudes. It is the magnitude of change that is notoriously easy to manipulate by changing the y-axis. Thank you al. I've enjoyed reading through this thread? and I think I've learned from the discussion. I appreciated the quality and sincerity of the discussion. I especially appreciate the work of the initiator, Stephan, and those who made comments from a statistics perspective. I was trained in epidemiology but ended up working in the field of endangered species conservation and wildlife refuge management. Retired now and trying to maintain a healthy lifestyle. Cheers. JB thanks for a sensible and civilised contribution to the discussion thread - I have also enjoyed and benefited from following this discussion. I know Stephan is intelligent enough to appreciate the motive behind some of the challenges presented to him by people like Valerie (and me and others) and has done well to engage in a civilised dialogue - and, dare I say, hold his ground admirably. This is the nature of science and academia - you don't expect to present something and not be challenged. Sadly some of the followers lack the necessary education to appreciate this and take sides passionately and religiously (but not intellectually)! Happy new year to all. Let there be more interesting discussions like this in 2016. Very interesting post! I sent these graphs to Nina Teicholz. I think she thought they were interesting but she pointed me to this paper that analyzes the same NHANES data and comes to somewhat different conclusions. Like your post, the paper shows that obesity (or rather BMI) has increased since 2000 (Fig 7). However, unlike your post, the paper shows that carbohydrate consumption has been flat since 2000 (Fig 3). The paper attempts to adjust for age, race, residence, and some known upsampling in the dataset. From your comments it appears that you have adjusted for age, but it is unclear to me whether you adjusted for anything else. I was wondering if you had any ideas about the source of the discrepancy? That is based on NHANES data, which are self-reported. Self-reported diet data are inaccurate. I generally rely on USDA Economic Research Service food disappearance data. They have their own limitations, but they don't suffer from self-report bias and I generally view them as more accurate, particularly for illustrating trends. Hi Stephan, interesting data. With heart disease and being pre-diabetic I switched to low carb end 2011. I dropped around 6 kgs but hit plateau after 6 months. 4 years later I would still gain weight as soon as I ate more carbs or more food. Minor angina remained like wrists tightening up soon on exercise. My problem I think is same problem that I see in your data. Delayed effects. Eating lots of sugar and carbs for years builds up an insulin resistance that usually is lifelong. This is why we see many more big bellies on people being 50,60,70 today than before. And many of us are trying to limit food intake and exercise but the insulin resistance built up for years pulls the wrong way. Nobody wants to freeze or be miserable by cutting calories. Result is that obesity is increasing in spite of lower sugar consumption, although now with some wiggles showing on the graph as it represent all ages combined. By intermittent fasting - in my case 3 weeks of fasting 5 days every week and eating normal (weekends) I lost 9 kgs, and lower belly measure and it seems to be staying off. That is two months ago and I am still at new lower weight, 83 from 92 kgs, 2 months later. I plan to hit 77 kgs later this summer. My key gain is however that my heart disease symptoms (wrist pain after walking 3-400 meters) disappeared after 2 fasting weeks and has not come back once since. It brings up a different aspect of insulin, as my calcium score scans has shown calcification in heart blood vessels before and also two years ago. You surely read of/ recall the widely reported test animal in the 1930's with a forgotten insulin drip and calcified veins, all downstream of drip insertion point. After my improvement I believe that fasting insulin (or average insulin) at a certain (not established) level have no effect at all on blood vessel calcifications. But higher levels cause increased deposits the test animal showed and lower levels as in my case, may cause a reduction of existing deposits. The latter probably through a different hormone/mechanism that may be dwarfed by too much insulin, the balance determining net outcome. I measured fasting insulin a few years ago, then 7 and I am booked in for tests now again. Also I will have a new calcium score scan shortly. Back to obesity, I gather my point was made clear above. Almost every person that became insulin resistant pre-diabetic before 2000 would today go on to increase marginal overweight to obesity unless much reduced calorie intake, exercise and hardship as it is near impossible to turn off well established insulin resistance by dieting. It is all down to past sugar consumption or too much carbs/insulinogenic foods over too long time. There are 2 separate populations merged in this graph of the total US population. The low carb movement has gained traction and started to decrease the total population average carb intake. Meanwhile the average Joe exposed to the same junk food as always continues to eat it and get fatter. Split the populations into low carb advocates and average Joes and see what the obesity figures look like. Dr Gerry, of course I agree that we have this split as well. But just going low carb does not reduce obtained insulin resistance although progress to obesity/diabetes-2 can be greatly slowed. Every year of junk food adds "so much" insulin resistance that accumulates as interest on interest and damage in proportion to current progress. Even telomere lengths shorten as insulin resistance increases. Intermittent Fasting (IF) can reduce insulin resistance, call it "Pay off part of the principal each fasting session"
The problem with such a representation of the "reality" is that on the left Y axis from bottom to the top, there is a 60% difference in the scale. On the right side, there is a 300% diference from the bottom to the top in the scale. There triggers an illusion or an exageration of the differences on the right that makes it look like a 50% difference in carb 40 to 20 while it is only a 10%, 105g to 95g difference between the highest consumption of sugar to the end of the data. So what that means is that all in all, a 10% reduction in sugar consumption is not enough to reverse the trend. SamAbroad, I would be really interested to hear what your diet looked like as I have experienced almost identical problems after following a low carb diet.